The eastgreenlandic word for ”hope” is ”neriunner”. It is closely related to the word for ”rainbow”, ”neriusaar”, meaning, that when we see a rainbow, there is hope! Ever since I first learned these words, I was fascinated by their connection. I wrote them down in my notebook. 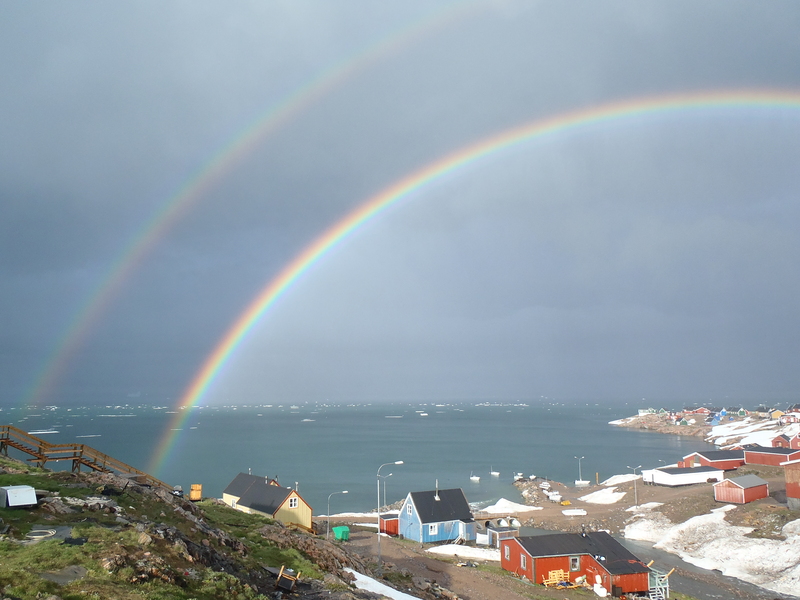 By now, I had not thought about them for years, since rainbows are very, very rare in the high arctic, where it often just rains a few days a year. However, this year seems to be different. Since the beginning of July, it has rained, rained … and rained. With a few sunny days in between. 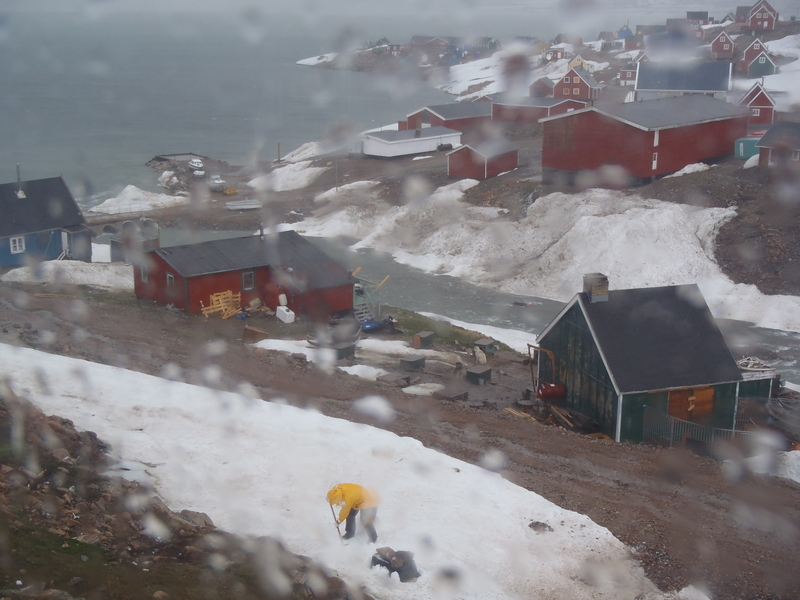 Ingkasi, in his yellow rain-jacket, is out to take care of some dog-food we still have “stored” in the snow. 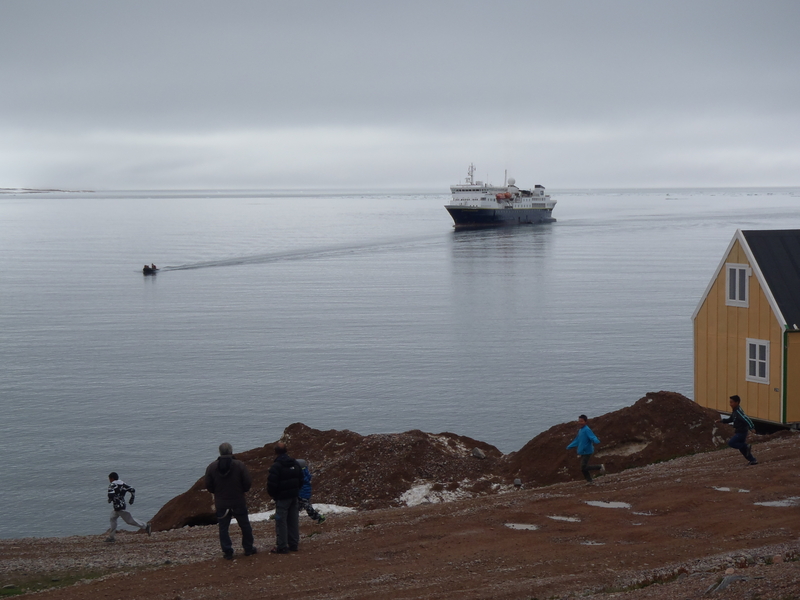 The first tourist boat arrived on Wednesday, July 9th, luckily one of the few (almost) dry days. Whenever the rain stops, it`s time to get some fresh air. 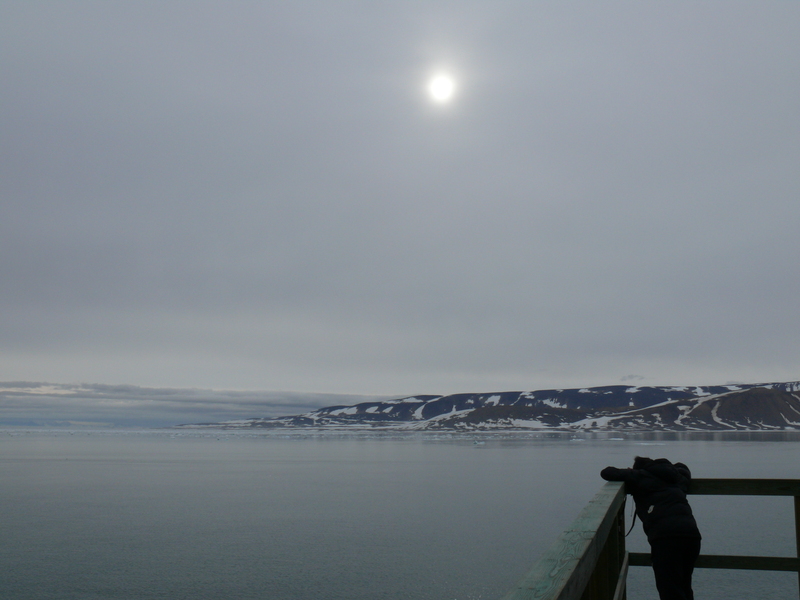 One day Ingkasi had spotted a polar bear out on the ice, and another one was seen close to “Store Steen”. They were too far away to photograph. We spend a long time watching them through our binoculars. One of the good things about all this rainy weather, however, was, that we got to see this beautiful rainbow! It appeared last week, at about 7 am in the morning. We could see it ”thouch” the earth at both ends. It was so incredible beautiful. At some point, I had to force myself to stop photographing, so I could enjoy the moment. Before the rainbow disappeared, the sun came out. Looking at this rainbow made me feel encouraged and hopeful about the future. That`s when I remembered the word “neriusaar”. 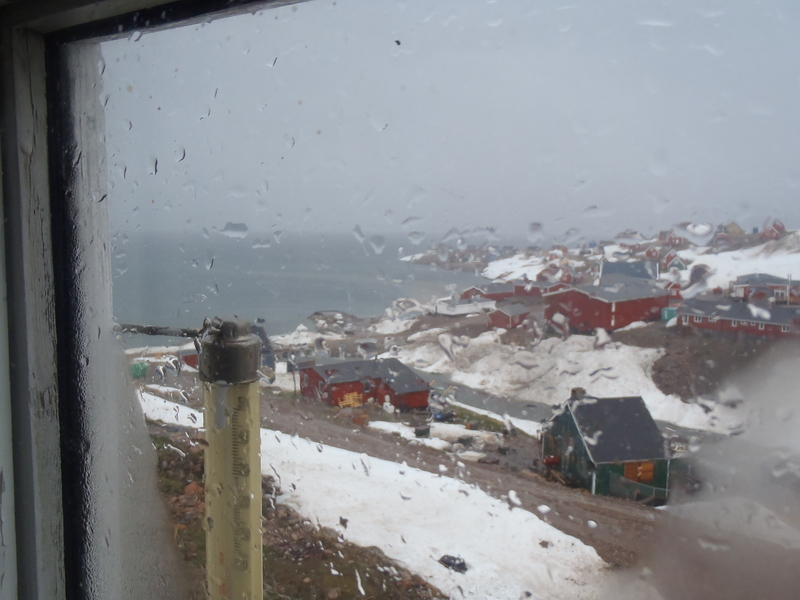 Friday and Saturday last week, we finally got a taste of “normal” summer in Ittoqqortoormiit. 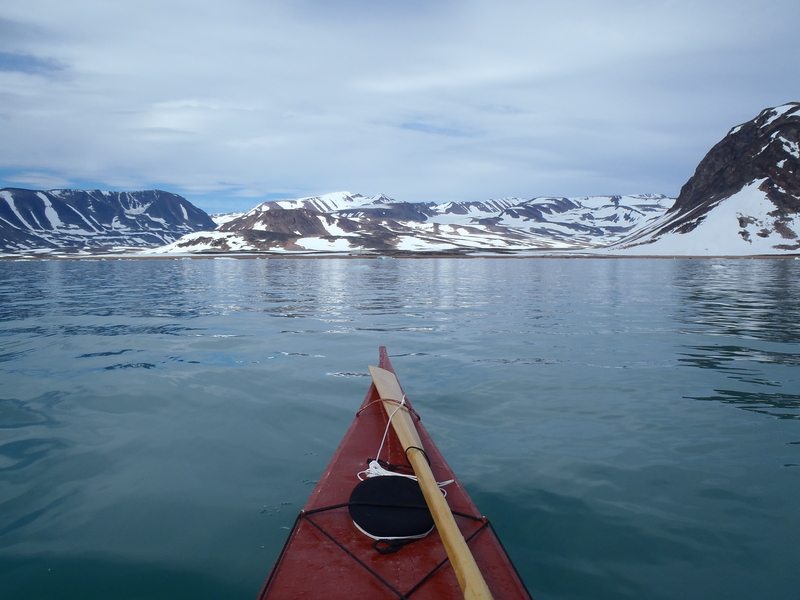 I used the opportunity to do get out in my Greenlandic kayak for a short paddle into Walrus Bay. It felt great to be close to the water and the ice! 🙂 While I am writing this, it is raining once again. Hello Ruth, What beautiful pictures of the rainbow. Thank you for sharing them There is a saying here that there is a pot of gold at the end of the rainbow!!! Thank you, Yvonne, – and I like that saying!!! Have a nice summer! A rare and beautiful event! My wife and I both really loved your post. How cool to see a rainbow like that! Thanks, – I´m glad to hear that!! Yes, it was a special moment…. I have a son who lived in Alaska for a few years. As inhospitable as the weather, mosquitoes, bears and no see ums could be he really liked it there. He used to talk about putting foil and plastic on the window during summer so they could sleep at “night.” He said a lot of businesses would be open up till 2 or 3 in the morning because people would be out and about. It looks much the same there, but with less commercial options. It’s great to speak with you. I have found so many interesting people since I started a blog.The internet is really beneficial to understanding other cultures. I actually found someone with a blog in China today and now here. You really wonder how people find you sometimes, especially when you have a WP blog you have made non engine searchable. I have been blogging only 6 months and have hits from 53 countries and am absolutely puzzled as to how they find me. It’s not like by blog has a broad-based international appeal, at least not that I know of. I often wonder if it is English speaking missionaries and people in government service? What do Barbados, Croatia, Hong Kong, Nepal and India have in common with what I have to say from and very American spin. Go figure. Anyway, glad I found another culture to explore. I love the way the associate hope with the a rainbow. Does a double rainbow carry more neriunner and significance than a single? Hello Dan, thanks for your comments, and good to hear you enjoy reading about Eastgreenland 🙂 and blogging in general. It is a great tool to learn about other cultures and ways of life, – expecially when you live in such a remote community like we do. I would love to visit northern Alaska at some point. 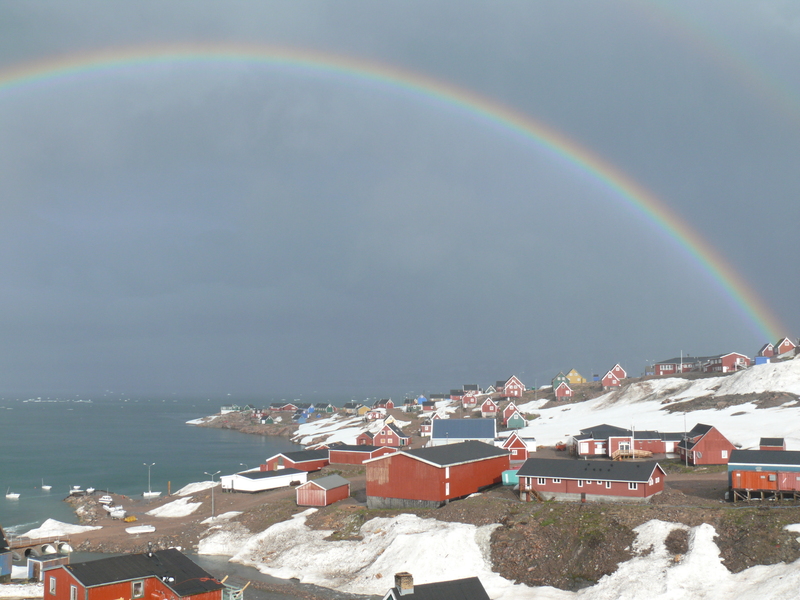 I like your question about the double rainbow, I´ll have to think more about that :-). I was wondering if living in an environment with less commercial distractions, i.e. fast food franchises, cine plexes, malls and the like, keeps you and other focused on the environment and things that sustain it and your way of life. It would seem you would be very much influenced by the weather and the seasons and be more focused on your neighbors and have a strong sense of community. If I am over dramatizing or romanticizing in a way that seems patronizing or insensitive I apologize. Just wanting to learn more. I don’t mean to infer a lack of sophistication or disinterest in the rest of the world. It just seems limited resources would work to direct your focus to different, more critical areas. Well, to some degree I think your description is right. The weather and seasons certainly play an important role in everyday life. 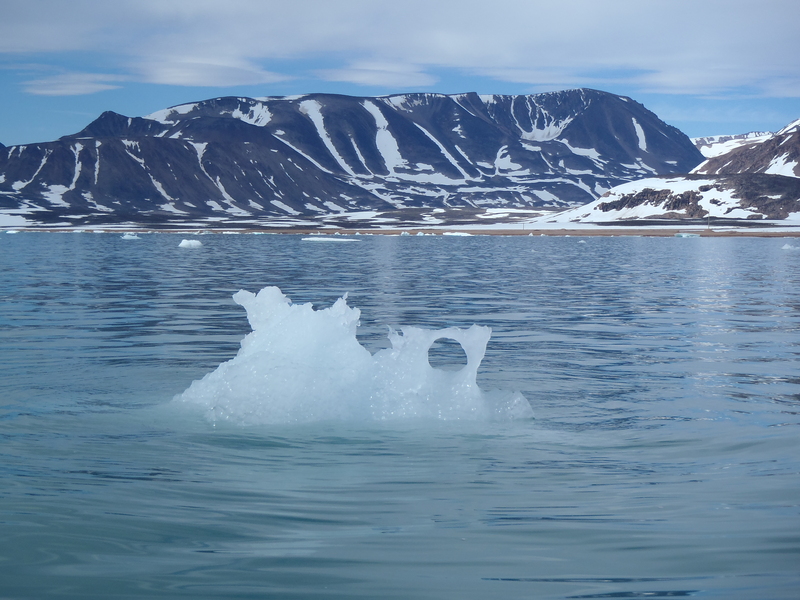 Also, people tend to spend a lot of time with their relatives and extended family, and have a strong connection to this particular part of Greenland. On the other hand, there`s Internet and TV. Many adulds and young people have a smartphone, are on facebook, might watch videos on You Tube, play games online, shop online, – you name it. In that way, the rest of the world with many of its distractions is always available, if you choose to “plugg in”. Beautiful rainbow photos! I just saw these today. 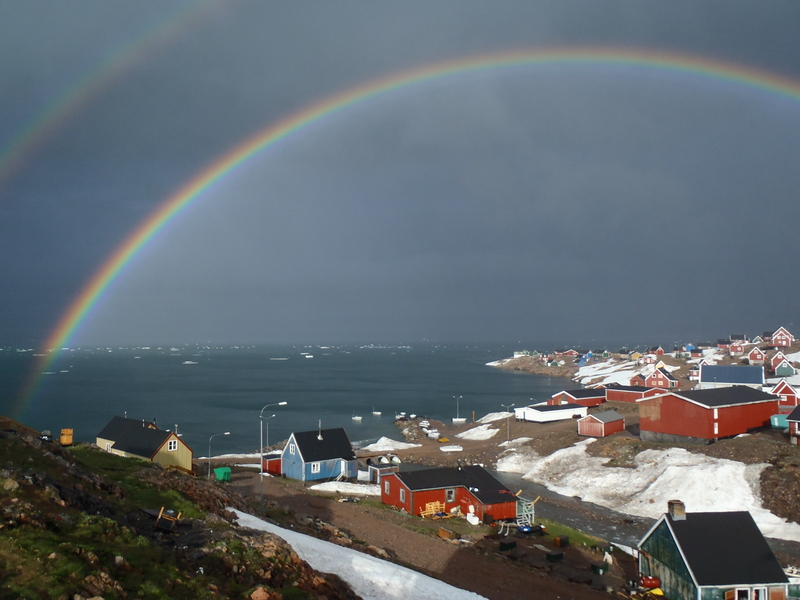 Being a believer in the flood story, I can see how the rainbow has carried it’s meaning within the people of Greenland. The rainbow of promise gives us hope. That’s great:-) We have had so much rain this summer too. Usually August is really hot and humid, but this year the rainy season has stretched out much longer than usual and today is actually quite ‘cool’ at 22 degrees! Crazy weather. The kayak pictures are lovely. Great post! Thank you, Rosh! We`ve had dry and mostly sunny weather for the last 3-4 weeks. 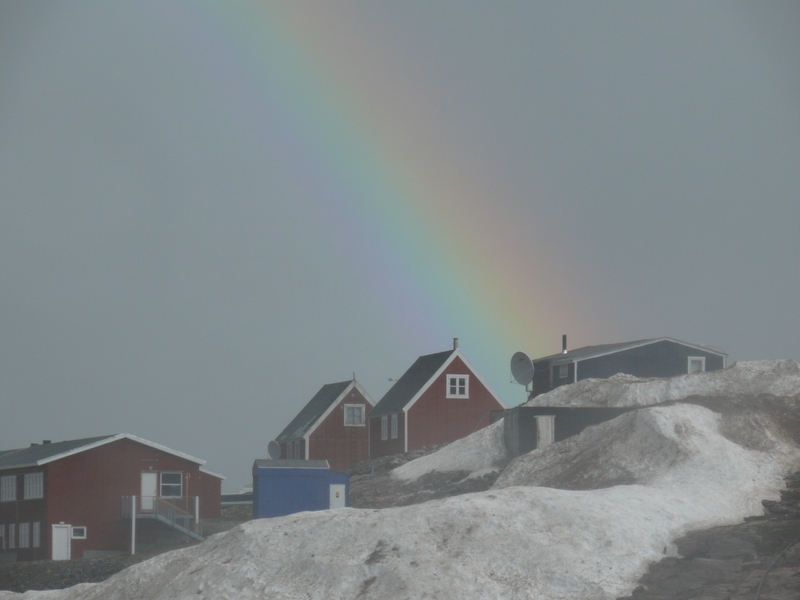 Just the way it should be 🙂 Arctic summers are short and busy, compared to the rest of the year, so I haven`t been blogging or reading other blogs very often ever since it stopped raining 🙂 I too believe the rainbow is a promise to us. When rain or tears have ben pouring down, it is reminding us of the fact that there is hope for the future, in spite of this lifes difficulties and pain….